Custer K-Spar is a high quality potash feldspar that has been continuously mined in the Black Hills, SD for over 80 years. “Custer Spar” is dry processed from large deposits of pure feldspar so no flotation chemicals are used in any of our products from chip sized to fine grind. For decades, it has been the choice of potters and artisans as well as industrial customers due to its high viscosity during firing, superior refractoriness and insulating properties. 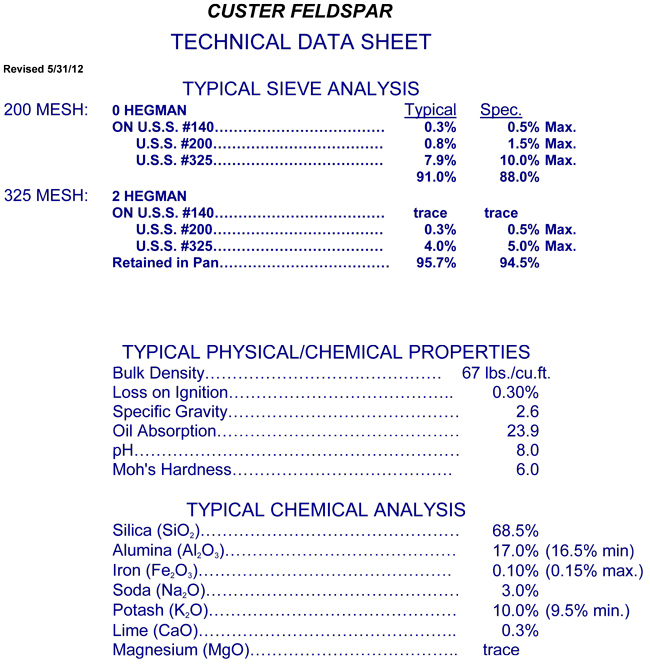 Typical applications for Custer Feldspar include whitewear ceramics, glazing applications, and electrical insulation. Custer Potash Feldspar is the premier functional mineral filler for all types of polymer and powder coatings applications. The properties of low oil absorption, high abrasion resistance and chemical inertness are a perfect fit in applications that demand high performance. Its refractive index will allow high loadings while maintaining good coatings clarity. Pacer’s Potash Feldspar is UV transparent. Custer feldspar is suitable for many applications in clay and in glaze where creates unique glaze properties.